Hey. Hey guys. Guys. Skype. I recently set my skype back up, out of boredom. Some of you should skype with me. Don't expect video chat XD but I'm bored 99% of the time, so if I'm awake, I'm pretty much available to IM. Re: Hey. Hey guys. Guys. Skype. This should also serve as a place to swap Skype usernames. If anyone wants to Skype with me, my handle is themrfountain. Mr. Finale wrote: I recently set my skype back up, out of boredom. Doesn't give his Skype name. Anyways, my Skype name is simply Nexeria. I'm like Finale where I don't really video or call chat on there (mostly because I think I'm cursed in that no matter what computer I use, Skype calls don't want to work on me), but I'm always down to IM. Forgot to mention. I'm Fishy Finale on skype. I'm more than willing to skype all of you, pretty much any time. 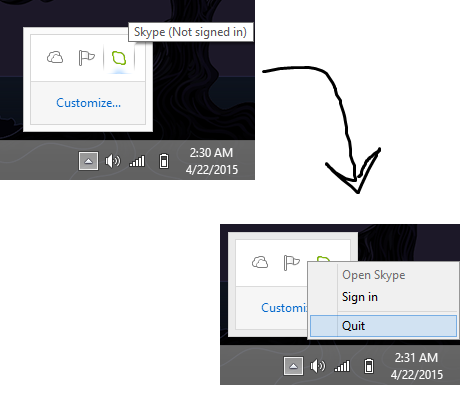 I refuse to use skype on the sole basis that it annoys me that hitting the x doesn't actually close the program. Thade wrote: I refuse to use skype on the sole basis that it annoys me that hitting the x doesn't actually close the program. Lots of programs are the same way. Steam for instance. I managed to mess with Steam enough that it closes when I tell it to. But for the life of me I can't get Spotify or Skype to. I don't usually ever need to close those programs, so I don't see a problem with the x button. It really pissed me off for a while that it was that way. But now that I kind of use skype, I don't really see a reason to ever want to close it. Thade wrote: I managed to mess with Steam enough that it closes when I tell it to. But for the life of me I can't get Spotify or Skype to. You know that you can just go into the task bar and close it right? What are you a wise guy? Nexeria wrote: What are you a wise guy? No, I was just trying to be genuinely helpful. ._. Too much work. It's the principle of the thing. Thade wrote: Too much work. It's the principle of the thing. Yeah, Fountain! That's like three or four extra clicks to go through. Ain't nobody got time for dat! Damnit, Thade. Wars have been started on principle! Now you can join the group dynamic! I'm the stupid one! ... I am aware. Remember the stupid one joke? Every time that I go to get back on skype after a few months, I forget all my old login stuff. Just add Fountain or Nex and I'll have them gimme your screen name so I can add you.